Six giant heads of woven willow branches emerge from under the trees at Orenco Woods Nature Park (7100 N.E. Birch St., Hillsboro). Head Over Heels, the beloved sculpture by nationally renowned artist Patrick Dougherty, turns two years old this month. To celebrate, Hillsboro Parks & Recreation and the Public Art Program are hosting several events, including repair parties to weave new branches into the sculpture on Friday, April 26, and a Family Day workshop and party with creative birthday treats on Saturday, April 27. Dougherty supervised over 150 volunteers who together contributed over 1,000 hours weaving sticks to create the artwork. 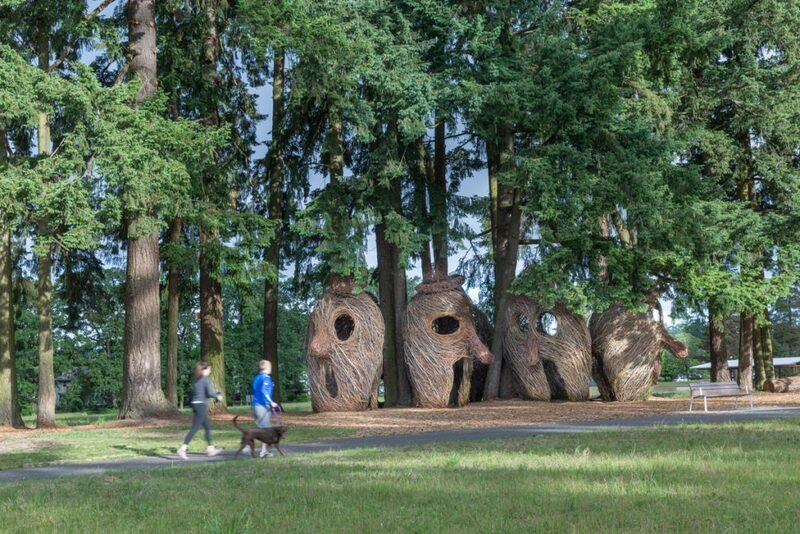 The sculpture has since become the most photographed location in Hillsboro, delighting children and adults alike with bulbous noses and gaping mouths that are perfect for photo ops. Dougherty designed the sculpture with pathways inside and between the heads, as well as around the majestic trees that shade the artwork. Repair parties are scheduled for Friday, April 26 to strengthen and replace branches, with the goal of giving the public several more years to enjoy the artwork. Both experienced and new volunteers are encouraged to participate. The Family Day workshop will take place on Saturday, April 27. Participants will learn how to build a structure out of branches and create an imaginative play feature for the park. Children of all ages are welcome with adult supervision. All tools and materials are provided. Family Day is free, but spaces are limited and pre-registration is required. Come work together, meet your neighbors, and create a new play area in the park. Since the party wouldn’t be complete without cake, everyone is welcome to stop by the small picnic shelter in Orenco Woods Nature Park on Saturday, April 27, 11 a.m. – 2 p.m. to create and enjoy their own birthday treat. Gluten free and low sugar options will be available. You can find full details about the events, and sign up to participate in repair party shifts or Stickworks Family Day, at Hillsboro-Oregon.gov/PublicArt. Head Over Heels was created by the Public Art Program of the City of Hillsboro’s Parks & Recreation Department. For more information about Public Art in Hillsboro, visit Hillsboro-Oregon.gov/PublicArt. What Artwork Would Make You Feel Welcome in Shute Park?